We'd done all the planning we could do and kept our fingers crossed for the one element we had no control over, the weather. The forecast was for a good weekend but we had contingency arrangements if the predictions were wrong. The coach from Longpré was due to arrive at ~22:15 but we received a text to say they had been given a place on an earlier ferry so would arrive at about 21:15. A few phone calls around Eastry had everyone at the village hall early to set out the chairs and refreshments. However, the promised earlier ferry slot never materialised and so our guests arrived at the hall as planned in the first place! 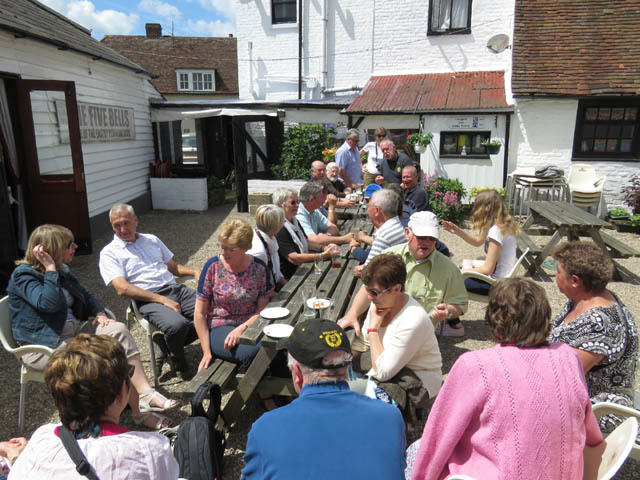 Once the coach was safely parked at the fire station and everyone was settled with some refreshments, Terry, chairman of the Eastry twinning association welcomed everybody and wished them a fun weekend. He invited Patricia, President of Longpré jumelage, to give her speech and afterwards she presented us a Rose of Peace, (more correctly known as Rosa Madame A. Meilland apparently). We will find a suitable position for it and put its photo on the website. One further gift to Eastry was presented by Patricia, it was from Max B, who unfortunately wasn't able to be with us this year. He has been involved for over 30 years and is usually the host/guest of Jenny L.
The gift was a boxed set of replica medals "COLLECTION 14-18 LA GRANDE GUERRE" and will be on display soon hopefully. Terry receives the gift of a 'Rose of Peace' from Patricia. Terry, with the aid of Marion as translator gave his speech and then presented a gift from Eastry. We had struggled for ideas for a suitable gift initially but as 2017 was the sapphire Jubilee of Queen Elizabeth II, we thought a commemorative photo was very appropriate. We were pleased to have several new members this year, it was the first visit to Eastry for Sophie, Frédérique, Camille and Charlie who were hosted by new members in Eastry, John and Terri. John had visited Longpré for Armistice Day last November and had been very impressed with the friendliness and warmth we received so wanted to join the Twinning. Another first timer was Bernard from Longpré, friends with Nadine, he had helped out as chauffeur around the war cemeteries for our visit last year. He was hosted by Robin and Peta. One other new couple had to cancel unfortunately due to ill health, Nadine's daughter Valérie and husband Eric (well known to us for their petanque skills during the competition for the ashes in Longpré!) Hopefully they can join us next time. It was fair to say that it had been a long day for everyone and we had a reasonably early start in the morning, so we tidied up the hall and headed home. Everyone made their way to St Peter's in Broadstairs for our guided tour of the older parts of the village. We were taken in parties of about 10 and we were shown parts of the village that even those of us that had been there several times had never seen before. We were honoured to have the Mayor welcome us, the tour has been running for several years but I think we were to be the first large French group to visit and they seemed very pleased to receive us. Marion had worked with others to create a précis of the tour in French which proved very useful in setting the scene for our guests. It was a very entertaining tour with the guides dressed in costumes of the era being covered. After the tour we went for lunch. Our attempts to find a venue for us all had failed so we separated into smaller groups and found somewhere that suited our needs. The 'players' in the St Peter's tour. Lunch near the bandstand on Broadstairs promenade. One thing we'd all agreed on was that it would be nice to have a little while to sit down and relax before we had to set out for the evening meal and dance at Stonelees golf club house. This in mind we headed home mid afternoon (for our party, only after we'd had an ice cream on the sea front!). I think it was a good idea, we had time to sit and chat with some refreshments before getting ready for the 18:30 departure on the coach. I hadn't appreciated how much room there was at Stonelees, when we arrived the dining area was set up, it looked very smart. I for one was very impressed with the venue, the food, the staff and Jo Scott, the musician. It all came together for a very enjoyable evening, something we always strive for but it isn't always delivered as promised. So well done everyone on the decisions we made as a committee. The annual petanque match got underway at a little after 10:00, the ashes had been brought over from Longpré and they were on the windowsill so we could all see what we were playing for! The competition is played in very good spirit but I'd be telling a fib if I said that either team wanted to lose. It was a lovely warm and sunny morning, ideal for the game. Everyone relaxing after the petanque game. 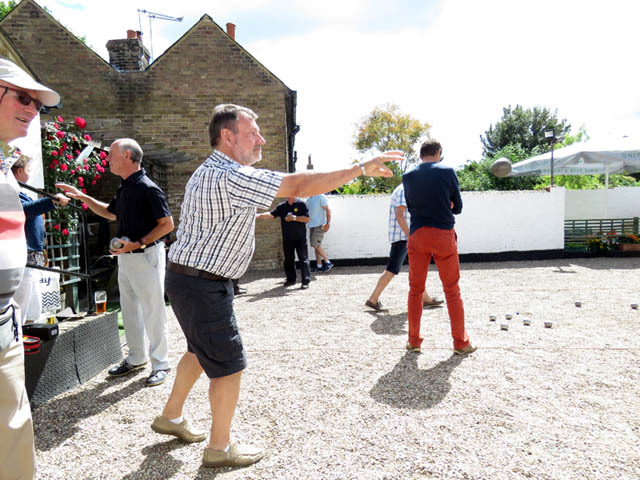 Those that weren't involved with the petanque had made arrangements to visit places locally - some went to Sandwich to explore, others to Kearsney Abbey gardens etc. The Sandwich small garden open day was on the same day but the gardens didn't open until the afternoon so it didn't fit in with our schedule but may be worth considering for another time. Longpré were one person short for the competition consequently they made Keith an honorary Longiprat so they could field a full squad. 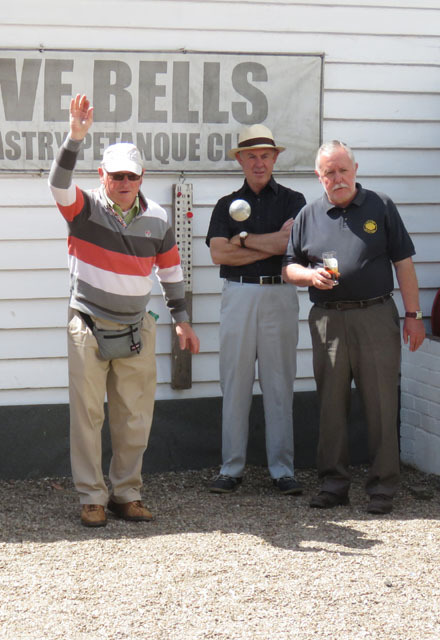 As I have written in previous accounts, a petanque match consists of 5 games up to 13 points (the first to win 13 points takes the game and 3 games wins the match; all five games are played to completion). We played the 2 games of triples first (3 players a side) and Eastry won both games, putting pressure on Longpré. They would have to win all 3 of the doubles games to win the competition. For quite some time it looked like they might do it, a nervous glance at the scoreboard showed the Longpré teams all in front, some with quite a lead. But, slowly Graham and Ray clawed back the score to a 'nail biting' 12 points each, and finally prevailing in the last end to win 13 points to 12. 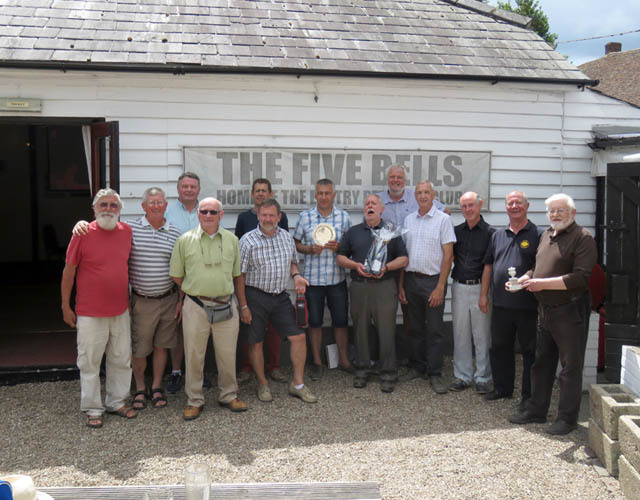 This gave Eastry the required three games, but it was very close (finishing 3:2), we had won back the ashes. 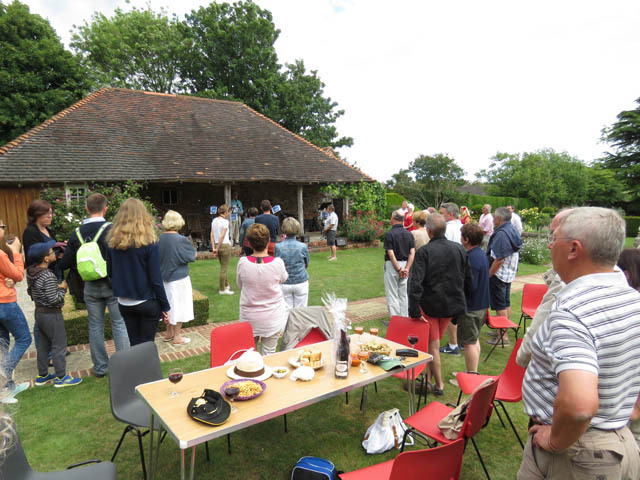 The afternoon festivities began as people arrived at Eastry Court around 1pm. 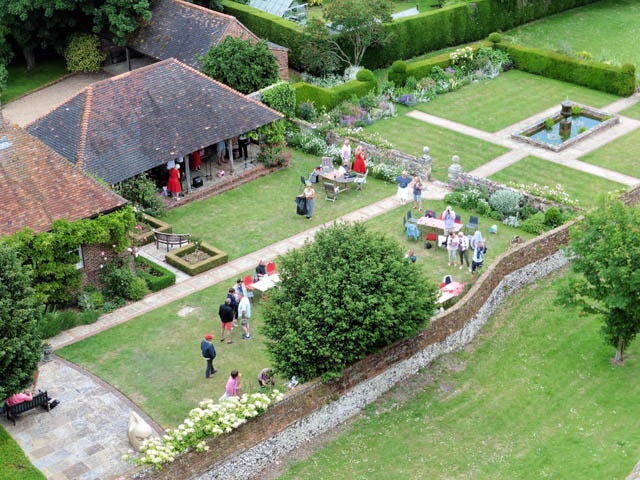 Lord Freud and wife Cilla had thrown open their lovely gardens for us as a location for a buffet picnic. 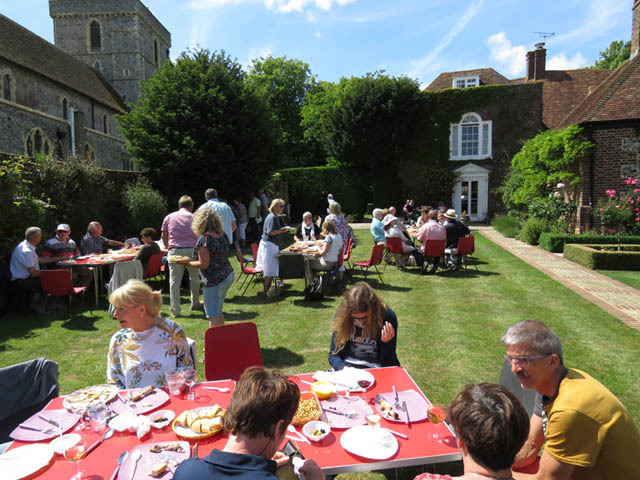 All the twinning members had worked hard to produce a magnificent spread of food, from whole cooked hams and seafood platters to quiche and salads, as well of course, as an array of deserts. Our concerns that we'd not have enough food were unfounded, there was plenty left at the end and everyone looked well fed and content! 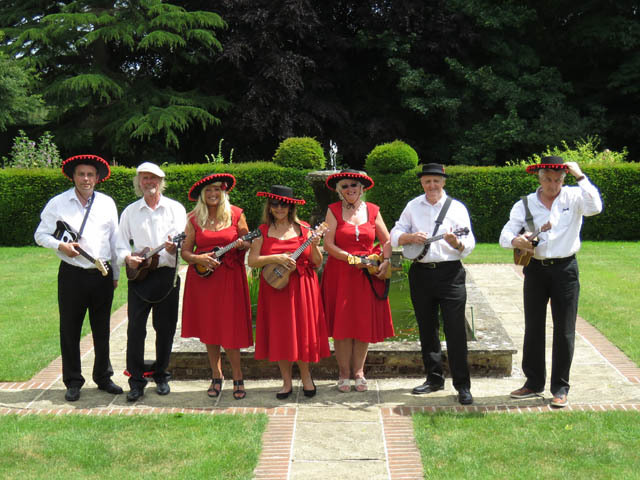 We had been very lucky in that we'd managed to get the SaltDish Ukulele Group to entertain us. They do not charge a fee but collect money for charity on the day. On this occasion they raised a fabulous £119.40 for the Royal British Legion. David Freud welcomes us to his garden. Everyone enjoying the picnic and gardens. A view from the church tower. Also very popular was the kind offer of one of our invited guests Rev. David Ridley to open the church and take people on a trip up the tower. With clear skies and bright sunshine everyone who went up the tower (which was most of us I think) had wonderful views around the village and surrounding countryside. As the saying goes, 'all good things must come to an end' and all too soon it was time for our guests to gather their things and prepare for their departure. This can take a little while as there are a lot of goodbye kisses and handshakes to be made and photographs to take before their departure accompanied by the usual refrain of " l'année prochaine" as we all waved farewell. It had been an excellent weekend, all our plans had been fulfilled and those things out of our hands once we'd made our decisions (like the weather, the evening meal, and the tour) had all been better than we could have realistically wished for. Hopefully a good introduction to the world of twinning to our newest Eastry members John and Terri and from Longpré, Bernard and the family Sophie, Frédérique Camille and Charlie. Nous avions dressé nos plans le plus efficacement possible, tout en espérant ardemment que la seule chose impossible à contrôler, le temps, n’allait pas les contrecarrer. Le météo promettait un bon weekend mais nous avions préparé des contre-proposition en cas d’imprévu. L’autocar de Longpré devait arriver à 22.15. Mais tout à coup nous avons reçu un texto qui expliquait que puisqu’on offrait des places dans un paquebot qui devait partir plus tôt, nos amis allaient arriver vers 21.15. Après quelques coups de téléphone un peu partout à Eastry, tout le monde s’est présenté dans la salle des fêtes de bonne heure afin d’organiser les chaises et le buffet. Cependant, les nouvelles places dans le paquebôt n’ayant pas matérialisé, nos invités sont arrivés à l’heure originale! Bernard, c’est un autre nouveau-venu. Étant un ami de Nadine, il avai été chauffeur dans son propre auto au cours de la visite aux cimetières. Robin et Peta l’ont accueilli chez eux. Malheureusement, la maladie a empêché un autre ménage de venir. Valérie, la fille de Nadine, et son mari, Eric, (deux joueurs de pétanque formidables dont nous nous rappelons les exploits au cours de la compétition des cendres à Longpré). Nous espérons les recevoir la prochaine fois que les amicales se retrouvent en Angleterre. On peut dire en toute justice que la journée avait été longue pour tout le monde. Étant obligés de repartir assez tôt le lendemain matin, nous avons mis de l’ordre dans la salle et sommes repartis à la maison. Tout le monde s’est dirigé vers St. Peter’s, Broadstairs, pour le tour historique des parties du village les plus anciennes. On nous a divisés en groupes d’approximativement dix personnes chacun. Ensuite on nous a montré de différentes parties du village que même ceux d’entre nous qui l’avaient visité plusieurs fois déjà n’avaient jamais vues.Monsieur le Maire nous a fait bon accueil car quoique ce tour existe depuis assez longtemps, nous, nous étions le premier groupe significatif de Français. L’équipe semblait ravie de nous recevoir. Marion avait travaillé avec plusieurs autres afin de préparer un résumé du tour en français, ce qui a bien aidé àen monter le décor, pour ainsi dire. Le tour fut très divertissant; les guides portaient des costumes de l’èpoque qu’on e–xplorait. Après on a pris le lunch. 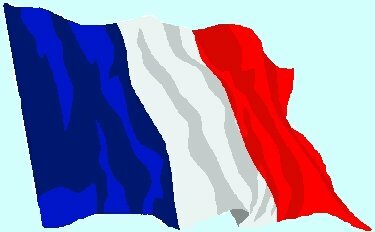 Tous nos efforts pour trouver un lieu communal étant sans succès, nous nous sommes séparés en de petits groupes et, pour chacun, le hôte anglais a trouvé un endroit agréable. On était d’accord pour un peu de repos, une pause qui permettait de s’asseoir, de causer, de grignoter quelque chose, avant d’être obligé de se préparer à ressortir pour le dîner et la soirèe dansante à Stonelees Golf Club. Je n’avais pas su combien il y avait d’espace à Stonelees. Quand nous y sommes arrivés, les couverts étaient prêts. L’ensemble avait l’air élégant. Moi, au moins, j’ai été impressionné par le restaurant, les mets, les employés et Jo Scott, notre musicien! Tout a combinÿ pour créér une soirée dynamique, quelque chose que nous essayons toujours d’obtenir mais ne réalisons pas toujours malgré toutes sortes de promesses. Alors, à tous nos membres, félicitations! La décision qu’on a prise ensemble en comité s’est réalisé comme dans un rêve. Le match de pétanque annuel a commencé juste après 10 heures du matin. Les cendres, on les avait apportés de Longpré et déposés sur le rebord de fenêtre. Alors on voyait le prix pour lequel onjouait. Lorsqu’on jouait, on était en verve mais dire que l’un ou l’autre était tout prêt à perdre, ça serait un petit mensonge. Il faisait beau, le soleil brillait. Une matinée idéale. À côté de Terry et de Robert, Alain est en train de lancer. Ceux qui ne s’intéressaient pas tellement à la pétanque, s’éetaient disposés à explorer les alentours. Quelques-uns sont allés à Sandwich, d’autres aux jardins de Kearsney Abbey etc, L’ouverture au public des petits jardins à Sandwich se passait le jour même mais seulement l’après-midi, ce qui ne s’accomodait pas à notre programme mais on pourrait y penser à l’avenir. Il manquait un joueur à Longpré. Alors, pour la durée de la compétition, on a fait de Keith un Longiprat honoraire, afin de compléter l’équipe. Comme je l’ai déjà expliqué, dans un match de pétanque il y a 5 jeux pour gagner 13 points (la première équipe qui gagne 13 points a gagné le jeu et 3 jeux gagnés ça gagne le match. On joue tous les 5 jeux jusqu’à la fin. D’abord nous avons joué les 2 jeux “triples” (3 joueurs chacun) et Eastry a gagné les jeux, ce qui a créé de la tension pour longpré: il fallait qu’ils gagnent les “doubles” tous les trois pour gagner la compétition. Pendant quelque temps, on dirait qu’ils allaient y réussir. Quand on se demandait nerveusement où en était le jeu, on voyait les équipes de Longpré toujours au-devant de nous, des fois avec un avantage assez grand. Cependant, petit à petit, Graham et Ray se sont repris jusqu’à ce que l’on se rongeait les ongles en regardant: parti nul, 12 chacun; finalement ils ont gagné, 13 contre 12. Ainsi Eastry avait gagné les 3 jeux nécessaires. Quelle arrivée serrée! 3 points contre 2. Nous avions repris les cendres. La réjouissance a éclaté vers 1 heure de l’après-midi lorsque les gens arrivaient à Eastry Court. Lord Freud et sa femme Cilla nous avaient offert leurs magnifiques jardins pour y tenir notrep pîque-nîque et buffet. Tous les membres de l’amicale avaient travaillé dur afin d’offrir un repas froid qui était un vrai régal: un grand jambon cuit, des fruits de mer dressés, des quiches, toutes sirtes de salade et, naturellement, un énorme étalage de desserts variés. Nous nous étions inquiétés, nous nous demandions s’il y aurait assez et assez de variété, mais à la fin les restes mêmes étaient amples. Tout le monde avait l’air satisfait, heureux. Nous avions eu la chance de réussir d’obtenir leSaltDish Ukulele Group, pour nous divertir. Au lieu de demander une rétribution, ils font la quête pour de différentes charités. Cette fois-ci ils ont pu donner au Royal British Legion £119.40, une somme très généreuse. Comme nous disons, “ toutes les belles choses arriven à leur fin”(all good things must come to an end). Trop tôt nos hôtes ont dû ramasser leurs affaires, se préparer à partir. Faire cela, ça prend du temps: beaucoup de bisous, les mains se serrent, les photos que l’on prend, avant le départ, le tout accompagné du refrain “à l’année prochaine” (next year . . .). On fait signe de la main, on sourit, au revoir. Ce weekend avait été excellent: tous nos plans réalisés, les choses qu’on ne contrôle pas (le temps, le dîner le soir, le tour) s’étaient bien passés, mieux que l’on ne l’aurait pu espérer avec réalisme. Nous espérons que ce weekend fut une bonne introduction au jumelage pour nos membres les plus récents: John et Terri d’Eastry, et, de Longpré, Bernard et la familleSophie, Frédérique, Camille et Charlie.